Isn't it awesome when bands rip on former members, something like five years after it actually matters? While cruising for news this morning, we came across an item about Korn. Essentially, frontman Jonathan Davis said in a recent interview that original members Brian 'Head' Welch and David Silveria didn't really contribute much to the band's initial recordings. "I'll lay it down to you right now: all the writing was done by Fieldy and Munky," Davis said. "David was there to write beats, but he wasn't really there. Head wasn't really there for any of it, because he was so jacked up on drugs and worrying about other things." It just seems rather ... I don't know, convenient to blast dudes who used to be in a band after the fact, and it makes us wonder why such revelations didn't surface when the guys were still in the band. If that's the truth, and Head and Silveria weren't "there," why not say that when people still care, when the albums they're credited with working on were still new, fresh? Why try and spark controversy years later, JD? We think Davis' comments are rather unfair, given Silveria's basically withdrawn from public life entirely and is unlikely to defend himself. We await Head's eventual, totally-witty-in-a-spiritual-way response, but for now, we've got some news for you. It's White Noise ... keeping you informed. + As I Lay Dying have written about seven songs for their next album, which they plan to start recording on Oct. 17. "At that point. We'll record as many songs as we can and then finish the album around the New Year," says frontman Tim Lambesis. "I think this will be a good way to spread out our songwriting since most of our previous records have always been written within a few months." + So, AC/DC have revealed all about 'Backtracks,' a 3 CD, 2 DVD, 1 LP box set of rarities that releases Nov. 10. The set will include a comprehensive collection of the band's studio and live rarities, all remastered. 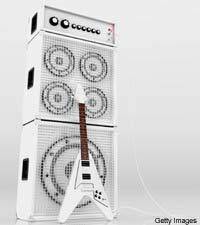 There will also be a 164-page hard-cover coffee table book, collectible merchandise reproductions, and a working guitar amp, complete with the band's original logo, which was spray-painted onto the rear of Angus and Malcolm Young's speaker cabinets in 1975. + That was quick. Limp Bizkit frontman Fred Durst, who married Esther Nazarov two months ago, has revealed through Twitter that he's getting a divorce. "For those of you inquiring, I will confirm that Esther and I have decided to go our separate ways and we both thank you for your support," he writes. "We remain very positive and wish only the best for each other." + According to reports, a Cleveland woman who has been convicted of assaulting a female police officer after a Mötley Crüe concert, and her lawyer claims she deserves probation as she was unaware she was struggling with a sheriff's deputy. The woman attacked the officer, who was trying to break up a fight. The cop suffered scratches about the face, and had her hair pulled. + Drummer Lyn Jeffs has left death metallers Annotations of an Autopsy. He plans on spending more time on his other band, Ingested. "I feel that they deserve a drummer who is 100 percent committed to what the band is doing," he said in a statement. "I've had a great time on tour with Annotations, and a great time meeting all the fans who have supported me and the band over the past year. I wish the band luck in the future and hope to share a stage again one day." + If you didn't like the last Velvet Revolver LP, blame Scott Weiland. Drummer Matt Sorum says in a recent interview that Weiland joined the band after the first record had been written, and "then Scott jumped on and we went on the road and did the record pretty quick. The second album, I think, we fell prey to more of what Scott wanted to do and we wanted to [do] straight-up rock and roll. I think this time around we would like to make a real strong rock album and stick with more of our roots." + Immortal have posted the title track from their forthcoming album over on their MySpace page. The band's album 'All Shall Fall' is set to for release Oct. 6. + Throwdown, Bury Your Dead, For Today, ABCABB and The World We Knew will be touring together this November. The tour kicks off Nov. 13 in Reno, Nev., and runs through Dec. 10 in El Paso, Texas.